I’ve started a process that’s changing my entire attitude about life and work. Day by day, this powerful catalyst will allow me to transform myself and the way I approach everything I do. 10 days ago I consciously started two new daily habits. I’ve been consistent and motivated, and taken care of these two things every day, even when I didn’t feel like it. I’ve committed myself to 30 days, then if things have gone well, another 30, so that they truly become habits. Once I’ve instilled them as habits, I know it will get MUCH easier. What are these two magic things? These are two little hinges that will swing the door of my life and work. I’ll tell you about them in a little while, but first, it’s important to know the back story. As an independent entrepreneur, I continually struggle with focus and always have more tasks on my To Do list than I can possibly accomplish. On my plate are things I know I should do, or want to do, or have promised to do. Day by day, I chip away at whatever is in front of me, but all too often, I find that at 5 pm, I still haven’t done “the thing” that I told myself was important to do that day. I had answered everyone’s emails, taken care of lots of little things, but not focused or prioritized well. They both deal with focus and prioritizing what’s important by setting specific goals in line with your long-term vision and mission. I created a 12 Week Plan that lays out what I’m setting out to accomplish in that time frame, broken up into weekly task lists and targets. To have success with this system, it’s important to start each day by reviewing the planning document, seeing where things stand, and deciding what to focus on and when. I’ve never been very good at planning my days or my long term goals. When I have a specific project, such as launching the Masters of ArchiCAD Summit, there is urgency and I make sure the most important things get done. However when it’s more long term, my efforts are sporadic and vulnerable to getting sidetracked with the many small but seemingly urgent tasks that each day brings up. 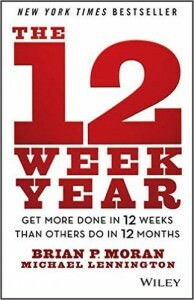 And I’m often jumping from task to task, or multi-tasking, rather than focusing on one thing and getting it done. My usual solution when I realize that I haven’t taken care of things that need to get done that day is to go back to my desk in the evening and work until midnight or 2 am, whatever it takes. Of course, this is not healthy, and impacts my family and my enjoyment of life, as well as my health. And since I am always a bit tired from the long day before, with a never-ending task list, my only exercise has been my 15 minute walk to Peet’s Coffee each morning (where I work for an hour or two on my laptop) and walking the dog with my wife a few times a week. When I get to Peet’s Coffee and settle down with my Latté and my laptop, instead of starting by going through my email, I’m reviewing my Weekly Plan and setting out my priorities for the day. Even though I may not get everything done, I’m making sure that first thing in the day I’m getting in touch with my “most important” goals and tasks, so I can make effective choices. After going through emails and doing some writing or other creative work at the café, I go home and do a workout (for the first time in years). 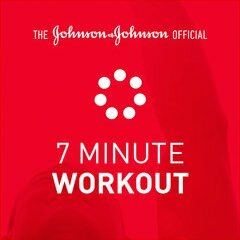 I’m using the Johnson & Johnson 7 Minute Workout app on my iPhone, which guides me through a series of exercises. They’re scientifically designed to alternate muscle groups with 30 second intervals of vigorous or isometric exercises, getting the maximum out of a short workout (you can do longer sessions, up to 20 minutes, with this app). The daily planning process will lead me to making more effective choices of how to focus my time throughout the day, and ultimately, getting traction on the most important things in my work and life. The daily workout sessions will give me more strength and fitness, as well as more energy to enjoy life and work even more effectively. This is an investment in my body and my life that will pay many types of dividends. 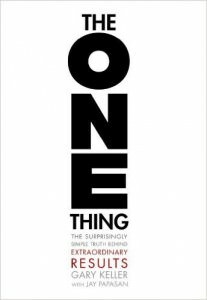 In the book The One Thing, the authors point out that trying to be extremely disciplined with everything in life is awfully hard, and that “will power” to follow through usually falters and gets used up while pushing through challenging tasks. They recommend choosing and developing productive habits, instilling each one by doing it consistently over a period of two months. Once it becomes a habit, it takes virtually no will power to do it, so you reap the rewards without expending as much effort. I feel really excited as I create these two specific habits, since they will definitely help make everything else in my life flow more easily. I’ll share my progress with you from time to time, and look forward to sharing the journey with you if you choose to try something like this yourself. On Tuesday December 3rd we broadcast my conversation with a few ArchiCAD experts (Jared Banks of Shoegnome and the BIM Engine Blog, Apollo Spiliotis of ArchiCAD Monkey, as well as architects Andrew Passacantando and Jack Suben) in a free Google Hangout on Air. We had a lot of fun talking about how ArchiCAD has changed over the years, and speculating about what’s coming up in the future. This is a follow-up to our popular broadcast in September “ArchiCAD 17 – A Game Changer”. We’re enjoying these gatherings so much that we’re planning to meet every 2 or 3 months. Have any ideas or suggestions for what we might focus on next time? Drop us a line, or post a comment. I feel this is a great way to build the community of ArchiCAD users from around the world, a virtual user group of sorts. In fact, I’ve set up a website for the ArchiCAD User Group Online, and will add more resources to it over time. If you have any ideas for how to make this website interesting, fun and useful, please email me or post a comment or suggestion below. 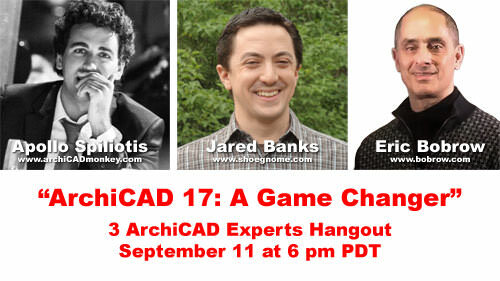 Special LIVE Event Wed. Sept. 11 at 6 pm PDT – 3 ArchiCAD Experts Hangout and talk about ArchiCAD 17! Free YouTube Hangout…the first time ever! Tomorrow night I’ll be hosting a special live event, a free YouTube Hangout on Air with fellow ArchiCAD experts Jared Banks and Apollo Spiliotis. This is groundbreaking in two different ways: it’s the first time I’m using Google’s Hangout on Air tool, and it’s also the first time that the three of us have had a chance to discuss ArchiCAD together. Plus, we’re going to talk about ArchiCAD 17, which changes a lot about how BIM works! In a Hangout on Air, the event is livestreamed with webcams, so you’ll see us, each in our separate home offices. You’ll also be able to type in questions and comments in a chat box, so it’s going to be interactive, and a whole lot of fun! ARCHICAD 17 – A GAME CHANGER! ArchiCAD 17 introduces some ground-breaking technologies. How does this change the BIM software landscape? 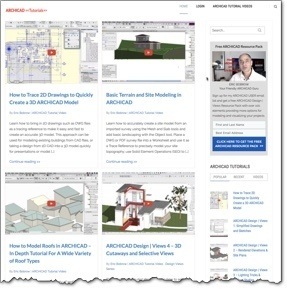 ArchiCAD continues to increase in popularity as evidenced by social media. Followers, fans and views are growing at an impressive rate. Where is this going, and what does it say about the future prospects of Graphisoft and ArchiCAD? For the first time ever, three of the top ArchiCAD experts in the world hang out together – join us for this special event! Jared Banks, AIA is an architect and well-known ArchiCAD expert. 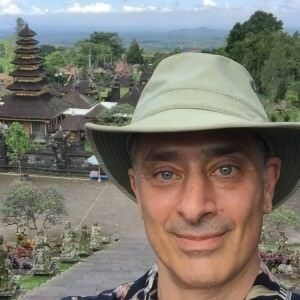 He runs Shoegnome.com and writes constantly about ArchiCAD, BIM and the intersection between technology and architectural design. His ArchiCAD tutorial channel on YouTube is approaching the 100,000 view milestone. Apollo Spiliotis is an architect, veteran ArchiCAD user, information-sharing addict, and technology enthusiast based in New York City. He is also the creator of archiCADMonkey, a blog where he shares exciting news, tutorials and interviews of luminaries from the design & tech world. 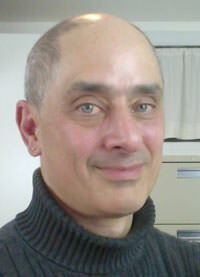 Eric Bobrow is an internationally recognized expert on ArchiCAD. His ArchiCAD Tutorials YouTube channel recently passed the 1 Million Views milestone, and his Best Practices Course and ArchiCAD Coaching Programs help 1,100+ users from 65 countries to use ArchiCAD more effectively. This event will be recorded and posted on my YouTube Channel, but it’s definitely more fun when you watch it “live”. I hope you can join us! This video is excerpted from the Best Practices Course, so course members may view it within the members area along with LOTS of other training resources.